Who loves tough conversations? You know, the ones where you tell someone that his behavior is unacceptable and you want it to change. The ones that you’ve put off having forever because you’re afraid you’ll lose it, either screaming or crying (a big fear for women) or both. Show of hands. Uh-huh. Just as I thought. 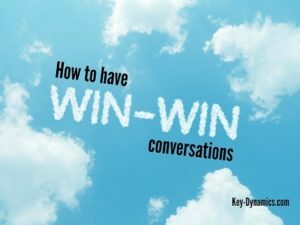 Here’s the good news: You can learn how to have these conversations and get so good at them that they become second nature. Underlying the tactics that I’ll get into in just a bit are these two important factors. Difficult conversations don’t have to be ugly or painful or anything else – but they all start with a change in your perception: Tell yourself that this is not a confrontation but simply a conversation. Your goal is not to beat up anyone but communicate what’s going on with you, then listening to what the other person has to say, back and forth, until you come to a resolution you can both live with. Whether your conversation is with a friend, loved one, work colleague, subordinate, vendor, client or anyone else, delaying this kind of conversation never ends well. The situation never goes away – even if the person dies, quits her job or otherwise moves out of your life. You’ll always be pulling an overloaded barge of negative feelings – anger, resentment, shame, anxiety, disgust, misery and anything else you care to throw into the emotional pot – because you didn’t handle the situation when you had the chance. If this person is in your life for the foreseeable future, whatever is bugging you will get bigger and uglier and will color your interactions and relationship with this individual. Every itty-bitty irritant is going to take on gigantic proportions and all those negative emotions you wanted to avoid by having the conversation are just going to grow and fester. It’s so much easier to handle an issue when it’s no big thing than it is to let it grow until you explode like Mount Vesuvius. And you know what happened to Pompeii. Take the initiative to make the situation better. You’ll feel better about yourself. Are you ready to do this? What follows are some tips that will help. Focus on the issue. Don’t get sucked in to name-calling, blaming or emotional behaviors. Remember, your reaction is yours, not something that someone forced you to do or feel. Use “I” statements. Say “When you said/did this, I felt ____” rather than “You’re such an idiot! You make me so angry I want to spit!” The first statement is not judgmental or blaming. It simply lays out the fact of the situation and how you felt. The second statement will get you into that verbal fistfight you’ve been trying to avoid. Preserve the other person’s dignity and learn something at the same time. Just because someone has done or said something stupid does not make them stupid. Try something like this: “You told me you would do the dishes after dinner and you haven’t done them yet. When will you get them finished?” Or “Last week you said the report would be completed today. It’s now the end of the day and I still don’t have it. What happened?” Going on the offensive closes the door to open and honest communication. Don’t burn your bridges. Presumably, you have some type of relationship with these difficult people that you want to – or must – maintain. Otherwise, their words or actions wouldn’t be an issue; you could ignore them and get on down the road. So be sure to act and speak in a way that allows you to maintain a constructive relationship with them. Talk, then listen. So many people don’t really listen. They’re just waiting for you to shut up so they can say what’s on their mind. Don’t be that individual. Hear what the other person has to say, not what you think they’re saying, and respond to that. Show them how it’s done. If you want people to be kind, you need to be kind. If you want people to work hard, you need to work hard. If you want people to keep their word, you need to do the same. If you want people to be responsive, you need to respond as well. If you want people to listen to you, you need to listen to them. Model the behavior you want to see and you’ll always have the high ground. Practice. If you’re having a problem with one particular person, find someone with whom you can practice the conversation. This gives you a safe space for “do-overs” and the confidence to incorporate these principles into your everyday life. Tell your do-over partner – spouse, coach or friend – what to listen for (especially blaming phrases and not owning up to your own feelings) and amend your conversation until you’re ready for the real deal. These tips are simple and can carry you a long way in all your business or personal relationships. That doesn’t make them easy, but they are well worth the effort. How about you? What techniques have worked well with you in dealing with difficult people or difficult situations? Please share below. Great suggestions. I also try to imagine the conversation beforehand. I see both parties having good conversation and see the other person in a positive light. I imagine it going well. This also helps to express verbally and non verbally in many of the ways you suggested. This is how I do most everything and helps greatly. Thanks! Great technique, Teresa. Visualization takes some of the (imagined) heat out of the conversation ahead of time. Good deal! What wonderful advice, Jackie–especially as folks gather with family for the holidays! The reframing it in your head works so well. You know, most people really just want to be heard. And by listening, truly listening, almost all situations get diffused. Then real communication can occur. So happy you liked it, Susan. One of the things I found out in the newspaper business (when I heard from irate readers) was that if I let them vent, just get it off their chests, 99% of them were happy that they were listened to. The other 1% would not have been happy if I’d played with a butcher knife in the middle of rush-hour traffic. This was such wonderful advice, Jackie. I used to avoid any conversation I thought would lead to confrontation and just like you said, the negative feelings simmered. Age has given me the confidence to speak out when I need to. I especially love your advice about listening – so important to hear what the other person has to say and not what you think they’re saying. Excellent! Good deal, Tami. So glad you’ve taken the bull by the horns and said your piece. And yes, listening is an important skill, for all conversations. Some great tips here, Jackie. I tend to procrastinate on these types of conversations, but that never makes things better, it just makes me mad longer. I like the idea of a practice partner, because practicing in your head does not help. Right on the money, Carol, in all respects. And I would agree — practicing in your head does not help. These are very good, practical, pieces of advice, Jackie. Unfortunately there are some people, with no matter how you say things will be defensive and not hear, but at least you know you tried and can keep the peace on your end. Indeed, Mindy. When you’re dealing with people with low self-esteem, especially, because feeling victimized is the only way they can feel better about themselves. As you point out — at least you’ve tried. You’ve clearly established your boundaries and then the rest is up to them. If they don’t honor those boundaries, then it’s time to pull the trigger on the consequences. One of the things I have learned is to frame it from your perspective. Say something like “When you do this…I feel this”, without putting the other person in a defensive mode. I do believe we humans tend to magnify an issue when we hang on to it and play it over and over in our heads allowing it to grow. I agree with you Jackie, that the sooner we choose to talk about the issue, the less time wasted magnifying it into something it isn’t. Oh yes, Beverley — “when you/then I” is a great way to handle such things. I did that with my mom and dad years ago when I went home for a visit. Each one was fraught with jabs and cutting words and finally I told them, “When you argue, it makes my stomach hurt. Please stop.” Then I added the consequences, “If you don’t stop, I will leave.” Worked like a charm. Great Article and Liked the part especially about using the I statements which help keep another not feeling attacked. Thanks for the great article. Glad you liked it, Lori. One thing I’ve noticed: Using “I” statements tend to make us vulnerable, and women don’t like that (men either, no doubt). It’s really brave to say how you are feeling as opposed to simply attacking someone else. I was decent at doing this until the appearance of Millennials, and all the tactics that once worked no longer seem to. Your article is timely and on topic, and I need to look at fresh approaches. That’s interesting, Robin. Please tell me how it changed with Millennials. Jackie, i was Meant to read this! I had something like this with my mum yesterday and when she said something quite mean, i let her know. I simply said to her that what she said was mean and it didn’t need to be said. I made it clear i wasn’t happy, but didn’t carry it on. Glad i did, otherwise i would have worried on it for weeks. Outstanding, Sonya! Good for you for saying something to her. What was the result? Did your mom apologize? Thanks, Joan, and you’re more than welcome. I wish ignoring difficult people would make them (and the situations) go away, but that rarely happens. Knowing how to handle confrontation is a great skill to have. Oh my! Glad to hear it worked out, Kristen. Yes, indeed, Katarina. One of the things coaches learn during training is how to be an active listener. Listening is an incredibly valuable skill for coaches who typically do most of their work over the phone and therefore have no physical cues (in terms of body language) as to what’s going on with their clients. Yes, this is a good practice. If one can master these, it can be a great way to have peaceful negotiations. Another resource I like is the book called “Non Violent Communication ” by Rosenberg. Thanks for the recommendation, Lorii. I’ll check it out. Love this Jackie. We can’t expect the other person to behave how we want so if we can do what you shared without expectation it is great. It hard sometimes to understand that regardless of our own skills at communication, the other person may not have that self-awareness. I clear with people right away unless I need some time to be clear on my blind spot. Then I journal and clear with them once I see my side of the issue. Self-honesty takes time to develop! Glad you liked it, Candess. Sadly, we way too often believe others should act according to our expectations. What a prescription for unhappiness and disaster that is! I agree about being clear about your own blind spots and taking a step back. Good advice.